BLTs are such an easy and satisfying lunch, but sometimes we're not in the mood for just another sandwich. Sometimes we're in the mood for another famous deli dish—the pasta salad. Pasta salads are simple to make and effortlessly feed a crowd, but rarely do they ascend to the level of main dish. 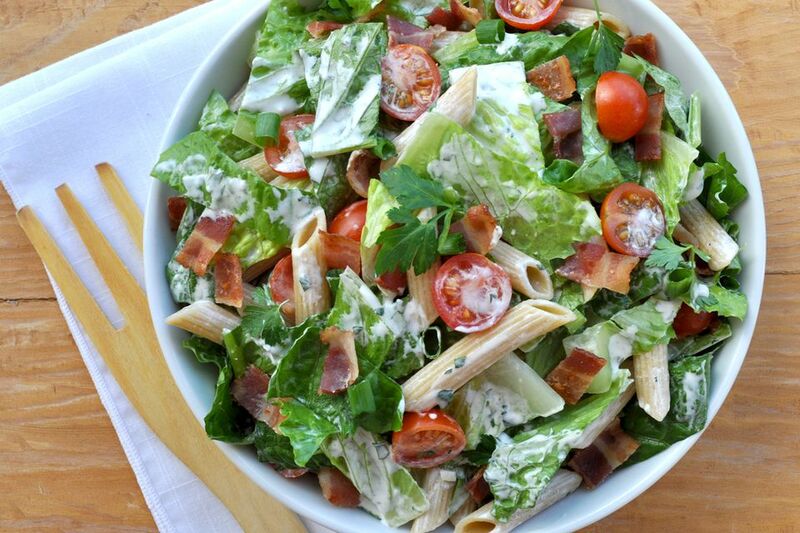 Thanks to lots of crunchy, fresh romaine lettuce, juicy tomatoes, and smoky bacon, this BLT pasta salad is all you need for a satisfying meal. When making this dish, feel free to use your favorite penne or rotini pasta, including whole wheat or gluten-free brands. Lots of green lettuce makes this pasta salad into more salad than pasta, transforming it into a complete meal. Swap out the sour cream for Greek yogurt to make the homemade ranch dressing healthier, or try the avocado dressing variation below. This dish is a meal all on it's own, but also works great as part of a picnic or lunch spread. Try serving it with Egyptian-Style Chicken Kebabs at a barbecue or picnic, or pair with a classic BLT side for lunch—Homemade Potato Chips. Put a pot of salted water on to boil. Add the pasta and cook according to package instructions, or until al dente. Drain and rinse with cold water. Let drain and cool completely. Cook the bacon in a large skillet, in two batches, until crispy, flipping halfway through. Drain on paper towels and chop once cool enough to handle. Alternatively, cook the bacon in the oven: Heat the oven to 400 F. Spread the bacon out in a single layer on a baking sheet. Bake for 15 to 20 minutes, or until crispy. Drain. Make the dressing: in a small mixing bowl, combine the mayonnaise, sour cream, garlic, parsley, and lemon juice. Season with salt and pepper and whisk until well mixed. In a large bowl, combine the pasta, dressing, romaine lettuce, tomatoes, and green onion. Toss well and taste for seasoning. Top with bacon. Serve immediately or refrigerate for up to an hour. If you plan to serve the pasta salad more than an hour after making, add the bacon just before serving to maintain crispness. For a healthier alternative to ranch-style dressing, make a creamy avocado dressing: Combine half of a large avocado, 2 tablespoons plain yogurt or sour cream, 1 garlic clove, 1 tablespoon lemon juice, and salt and pepper in a small blender or food processor. Blend until smooth and add up to a tablespoon of water if needed.